Welcome to the explanation of why the cover art for the Del Rey edition of The Unwilling Warlord had nothing to do with the story. Usually, in the days before everything was done digitally, when I wrote a novel, it went off to the publisher, and a few months later I would receive the page proofs where I could correct typos or other minor errors, and about the same time I would receive a cover proof that I could theoretically correct errors on, except that the publisher almost never actually fixed any of the errors I pointed out, in either art or text, on the cover proof. A few months later the book would get published, with the corrections I made to the page proofs, and an apology from the editor for the failure to make corrections to the cover. Sometimes, though, the page proofs and the cover proof didn't arrive at the same time. I didn't usually pay much attention when this happened; generally, whichever was late would show up eventually. 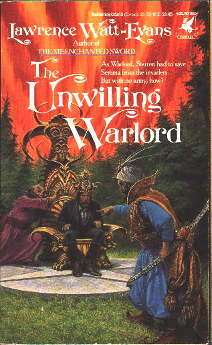 On The Unwilling Warlord, the cover proof was very late in arriving -- as in, as of September 1989, about six weeks before the book hit the stores, I still hadn't seen it. I was beginning to wonder about it. And then, at a convention, I met Darrell Sweet for the first time -- very nice guy -- and the first thing he did upon realizing who I was was to apologize to me. I had a very bad feeling about that. It wasn't his fault, though; he wasn't the one who should have been apologizing. What had happened was that Del Rey had commissioned two cover paintings from him, one for The Unwilling Warlord and one for Lloyd Arthur Eshbach's The Scroll of Lucifer, and he'd gotten sketches approved for both of them, and he'd gone ahead and done the Eshbach story's cover, and then gotten busy with another project and not done mine right away. And when he got back to it, he called the art director at Del Rey and asked when they needed it, and was told he'd already done the Watt-Evans, and they needed the Eshbach in a couple of weeks. 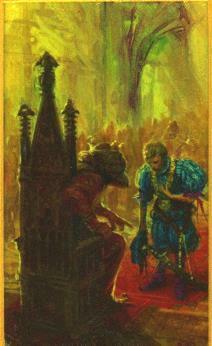 They'd put the original cover for The Scroll of Lucifer on The Unwilling Warlord. So Darrell painted a second cover for The Scroll of Lucifer, and never did one for The Unwilling Warlord. When I got home from the convention the cover proof for The Unwilling Warlord was waiting for me, and sure enough, it had nothing to do with the story. Some time later, though, when I bought another painting from Darrell, he was nice enough to throw in the color sketches he'd done for The Unwilling Warlord. I've scanned in the one the art director picked, so now, to the right, you can see what the cover was supposed to look like!